As Michigan Democrats gathered this weekend in Detroit to pick new party leadership, the 2020 election loomed large. Almost 3,000 activists filled Cobo Hall and elected Michigan Democratic Party Chief Operating Officer Lavora Barnes as chair. Leaders also talked about 2018 victories and how to defeat President Donald Trump next year. In an interview last month with the Advance, Attorney General Dana Nessel praised her predecessor, Bill Schuette, during the transition. But on Saturday, she told Democrats that she’s gotten accolades for her work one month in after succeeding the term-limited Republican. Schuette lost his gubernatorial bid last year to now-Gov. Gretchen Whitmer. Nessel has been busy reversing course on several federal lawsuits Schuette had intervened in involving LGBTQ rights, reproductive rights and the separation between church and state. 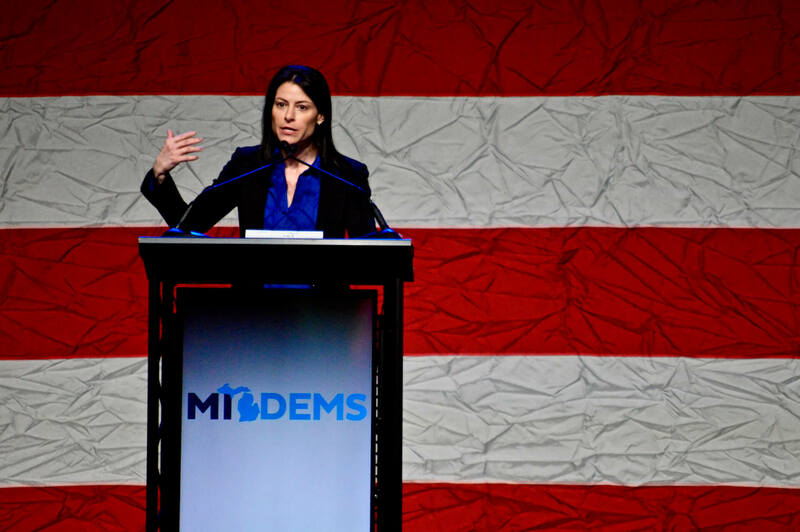 “Thank you, Michigan Democratic Party, for giving me the opportunity to fulfill a lifelong dream, because at long last, I have been able to sue the Trump administration,” Nessel said. Freshman U.S. Rep. Rashida Tlaib (D-Detroit) repeated her famous call to impeach Trump, but she didn’t curse this time. Whitmer acknowledged Dems’ big 2018 victories, but urged activists to help her with her agenda. U.S. Sen. Debbie Stabenow (D-Lansing), who earned a third term in November, had a dig for her old nemesis, Republican John Engler, who served as both governor and Senate majority leader while she was a state lawmaker. The senior U.S. senator noted at the confab that he’s “no longer president” of Michigan State University. Engler angrily resigned as interim president after a series of firestorms over his treatment of sexual assault survivors of former MSU Dr. Larry Nassar. Engler’s longtime ally, Robert Young — who he also had appointed as a Michigan Supreme Court justice — was fired on Friday as MSU’s lead attorney. Stabenow said Democrats need to focus on ensuring that Michigan’s other U.S. senator, Gary Peters (D-Bloomfield Twp. ), is re-elected to a second term in 2020. “I’m asking all of you to join me — to put the walking shoes, get out the checkbook, to get engaged to be make sure that we are sending back my partner to the United States Senate,” Stabenow said. As the Advance has reported, some progressives have made noises putting up a challenge to Peters in next year’s Democratic primary. Peters tweeted throughout the day and stopped in various caucuses taking place. Lt. Gov. Garlin Gilchrist echoed the need for Democrats to stay vigilant this year. Advance reporter Ken Coleman contributed to this story.